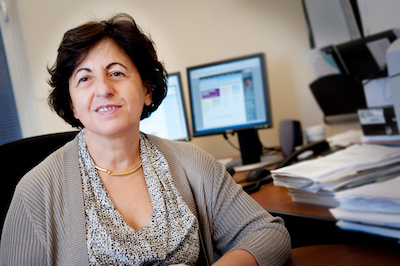 Elisa Bertino, Samuel Conte Professor of Computer Science, has been named the 2019-2020 Athena Lecturer by the ACM. Initiated in 2006, the Association of Computing Machinery (ACM) Athena Lecturer Award recognizes women researchers that have made pioneering contributions to computer science. Each year ACM honors a preeminent computer scientist as the Athena Lecturer. Previous winners include: Jennifer Rexford, Jennifer Widom, Nancy Lynch, and Shafi Goldwasser. Bertino is being honored for her significant research contributions to data management, security, and privacy. "Bertino's world renowned work on access control systems has provided the foundation for modern context and attribute access control models,” said Susanne Hambrusch, Interim Department Head, Professor of Computer Science. “These models are critical for in-depth data protection. Her more recent work on security of sensor networks and cellular networks is equally impressive and of high impact. Her highly creative ideas have had a major impact on cybersecurity and data management systems. She has tirelessly mentored junior female researchers. She is a role model." Among her accomplishments is the definition the temporal role-based access control (T-RBAC) model. Modern environments, with mobility and the need for fine-grained access control on data, require that access control decisions take context into account. The T-RBAC model is based on the key idea that roles may be available to users at certain time periods and unavailable at other times. T-RBAC supports periodic role enabling and disabling - possibly with individual exceptions for particular users. T-RBAC also supports temporal dependencies among roles, making it possible to specify that a role can be enabled, only if another role has also been enabled. Bertino’s paper introducing T-RBAC (published in ACM Transactions on Information and Systems Security in 2001) has more than 1000 citations in Google Scholar. Recent work by Bertino and her team on security and privacy of 4G and 5G cellular network protocols led to the identification of several vulnerabilities that can be easily exploited by attackers. Currently, she is exploring the many aspects of data transparency to enable the fair, secure, and privacy-aware use of data by different parties in today’s big data ecosystem. Professor Bertino joined Purdue’s Department of Computer Science in 2004. An outstanding educator and mentor, her PhD students – of which 16 are women, have been placed in universities and research labs around the world. Previously Bertino held the position of professor at the University of Milano, Italy. Early in her career, she was a researcher at the Italian National Research Council and held postdoc and visiting researcher positions in the US. She is a Fellow of the ACM, the IEEE, and the AAAS. She received the IEEE Computer Society Technical Achievement Award (2002), the IEEE Tsutomu Kanai Award (2005), and the ACM SIGSAC Outstanding Contributions Award (2014). In 2017, she was inducted in the Information Systems Security Association (ISSA) Hall of Fame. In 2018, she was named to the GSMA Mobile Security Research Hall of Fame. She lectures frequently in the US and worldwide as a keynote and invited speaker. Bertino has served on editorial boards of leading journals and on program committees for influential conferences and workshops within the profession. She co-founded the ACM Conference on Data Application, Security and Privacy (CODASPY). Bertino, E., Bonatti, P. A., & Ferrari, E. (2001). TRBAC: A temporal role-based access control model. ACM Transactions on Information and System Security (TISSEC), 4(3), 191-233. Hussain, S. R., Chowdhury, O., Mehnaz, S., & Bertino, E. (2018, February). LTEInspector: A systematic approach for adversarial testing of 4G LTE. In Network and Distributed Systems Security (NDSS) Symposium (Vol. 2018). Hussain, S. R., Echeverria, M., Chowdhury, O., Li, N., & Bertino, E. (2019). Privacy Attacks to the 4G and 5G Cellular Paging Protocols Using Side Channel Information.